We create Perceptual and Adaptive Learning Modules (PALMs) that incorporate revolutionary tools to accelerate learning beyond what is possible using conventional instruction. address training clinical pattern recognition. 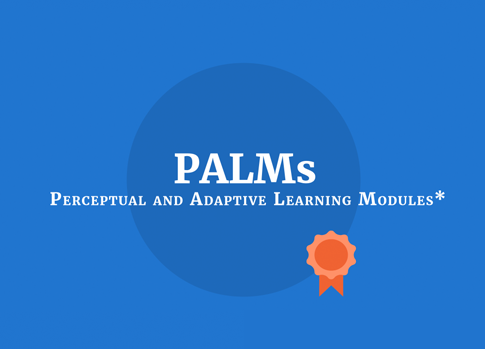 Our Perceptual and Adaptive Learning Modules™ (PALMs) offer systematic ways of teaching pattern recognition, and our Perceptual-Adaptive Courseware™ (PAC) provides a transformative approach to whole courses by adaptively integrating conventional instruction with effective interactive learning. We have developed uniquely effective learning software using perceptual and adaptive learning techniques that can be applied to almost any learning domain, based on 20 years of scientific research in laboratories at UCLA and the University of Pennsylvania. Insight Learning Technology has been funded by the US Department of Education, the National Science Foundation, NASA, the Department of Defense, and the US Department of Education's Small Business Innovation Research (SBIR) program, and has been the subject of much press coverage, including articles by the New York Times, New Scientist magazine, and CBS News - The Early Show. Learning to interpret signs, symptoms, and clinical test results is a central goal of medical education. Unfortunately, current didactic approaches, using books, videos, lectures, and note-taking, are not effective ways to develop these pattern-recognition skills. Cut the time and cost of learning. Fix spotty, transient, or incomplete learning. Our medical students, residents, and nurse practitioners have achieved learning breakthroughs in many areas of health sciences training such as histopathology, electrophysiology, and more. We have helped numerous students efficiently increase accuracy and fluency in basic math, pre-algebra, algebra, and even the math section of the SAT. Visit our math site to learn more. Many organizations, such as The US Department of Defense, have used our custom-built products to cut the time and cost of learning and to eliminate spotty, transient, or incomplete learning. PALMs have helped many K-12 students, medical trainees and professionals develop deep understanding and automaticity with difficult subjects. "The work is novel, relevant to all anaesthetists involved in training programs, and contributes valuable knowledge to educational approaches to learning TEE. This small study opens up a fascinating area for educational research, with the potential to revolutionise our traditional approaches to learning in anaesthesia." Weller, J. M. (2016). BJA, 117, 545-6. PALMs have helped many medical students, trainees and professionals develop deep understanding and automaticity with difficult subjects.